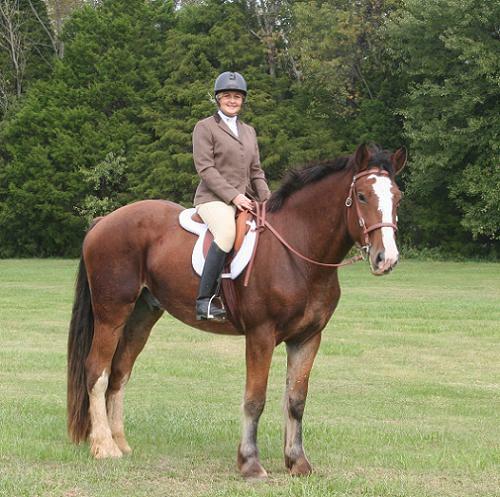 Liz Booth founded Virginia Sport Horses, located near Montpelier Virginia, in 2002. It is now the largest supplier of Canadian-bred sport horse prospects on the East Coast. VSH imports, raises, trains, sells, and ships horses throughout the continental US. Liz’s involvement with horses reaches back over 40 years to her first “job” hacking hunt horses in Chester Springs PA, and spans a variety of disciplines, but her true passion is natural horsemanship, and she spends untold hours working with young unhandled horses, as well as bringing along green horses under saddle. Each year Liz and her team visit many farms in Canada, Indiana, Ohio and Kentucky to view breeding stock and select young prospects. Young horses are raised on over 200 acres of pasture on two VSH operated farms located in Central Virginia. VSH focuses on fox hunting and horses having a temperament and calm demeanor suitable for use by today's mature rider to enjoy a wide variety of field work, including cross country, eventing, dressage and trail/pleasure riding. Many of the VSH “signature” Clydesdale crosses and TB/Percheron crosses are now hunting with Deep Run, Grand Canyon Hounds, Cheshire Hounds, Andrews Bridge, Rolling Rock, Tejon Hounds, Loudoun West, River Valley, Fort Leavenworth, Fairfax, Red Mountain, Iron Bridge, Live Oak, Whiskey Road, Aiken, Windy Hollow, Potomac, Bull Run, Middleburg, Piedmont, Old Dominion, Myopia, Golden's Bridge, Snickersville, Goshen, Moore Co, Brandywine, Glenmore, Red Rock, Princess Anne, Rockbridge, CFHH, Rappahannock, Whitworth Hardaway, Treasure State, Lynnhaven Hounds and Keswick hunts, (to name a few)and have been featured in the October 2005 issue of Covertside, the journal of the Master of Fox Hounds Association. Several of our horses have been inspected by the American Warmblood Society, were eligible for the Supreme Brand, and have received both Blue and Red Preferred Status. Many others have gone on to excel in the hunter show ring, star in films, train for mounted police work, event, compete in dressage and jumping, or to simply make dreams come true as wonderfully quiet and gentle pleasure horses. VSH and VSH alumnae have received coverage in such publications as Practical Horseman, Covertside as well as local newspaper and television coverage. Liz's articles on crossbreeding and purchase and selection of sport horse candidates have appeared on the websites of various registries such as the DCBOA. Our signature Clydesdale crosses have been the horses chosen to participate in the Virginia Equine Extravaganza East Coast Trainers Challenge since it's inception in 2006 due to their accepting nature extreme trainability. VSH stands 4 stallions, 1 AWS and ASHA Reg Thoroshire Shire Sporthorse, 1 ACPS Reg and AWS Inspected Connemara, 1 Irish Draught Sport Horse, 1 Reg Spotted Draft and 1 JC Reg 16.2H TB. VSH seeks to breed gentle, accepting and trainable horses having a temperament of 1-3 and the athletic ability for today's amateur rider.